Cancer immunotherapy (sometimes called immuno-oncology) is the artificial stimulation of the immune system to treat cancer, improving on the system's natural ability to fight cancer. It is an application of the fundamental research of cancer immunology and a growing subspecialty of oncology. It exploits the fact that cancer cells often have tumor antigens, molecules on their surface that can be detected by the antibody proteins of the immune system, binding to them. The tumor antigens are often proteins or other macromolecules (e.g. carbohydrates). Normal antibodies bind to external pathogens, but the modified immunotherapy antibodies bind to the tumor antigens marking and identifying the cancer cells for the immune system to inhibit or kill. Immunotherapies can be categorized as active, passive or hybrid (active and passive). Active immunotherapy directs the immune system to attack tumor cells by targeting tumor antigens. Passive immunotherapies enhance existing anti-tumor responses and include the use of monoclonal antibodies, lymphocytes and cytokines. A wide range of cancers can be treated by various immunotherapy medicines that have been approved in many jurisdictions around the world. Passive antibody therapies commonly involve the targeting of Cell surface receptors and include CD20, CD274 and CD279 antibodies. Once bound to a cancer antigen, the modified antibodies can induce antibody-dependent cell-mediated cytotoxicity, activate the complement system, or prevent a receptor from interacting with its ligand, all of which can lead to cell death. Approved immunotherapy antibodies include alemtuzumab, ipilimumab, nivolumab, ofatumumab, pembrolizumab and rituximab. Active cellular therapies usually involve the removal of immune cells from the blood or from a tumor. Those specific for the tumor are grown in culture and returned to the patient where they attack the tumor; alternatively, immune cells can be genetically engineered to express a tumor-specific receptor, cultured and returned to the patient. Cell types that can be used in this way are natural killer (NK) cells, lymphokine-activated killer cells, cytotoxic T cells and dendritic cells. Blood cells are removed from the body, incubated with tumour antigen(s) and activated. Mature dendritic cells are then returned to the original cancer-bearing donor to induce an immune response. 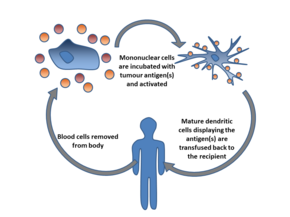 Dendritic cell therapy provokes anti-tumor responses by causing dendritic cells to present tumor antigens to lymphocytes, which activates them, priming them to kill other cells that present the antigen. Dendritic cells are antigen presenting cells (APCs) in the mammalian immune system. In cancer treatment they aid cancer antigen targeting. The only approved cellular cancer therapy based on dendritic cells is sipuleucel-T.
One method of inducing dendritic cells to present tumor antigens is by vaccination with autologous tumor lysates or short peptides (small parts of protein that correspond to the protein antigens on cancer cells). These peptides are often given in combination with adjuvants (highly immunogenic substances) to increase the immune and anti-tumor responses. Other adjuvants include proteins or other chemicals that attract and/or activate dendritic cells, such as granulocyte macrophage colony-stimulating factor (GM-CSF). The most common source of antigens used for dendritic cell vaccine in Glioblastoma (GBM) as an aggressive brain tumor were whole tumor lysate, CMV antigen RNA and tumor associated peptides like EGFRvIII. Dendritic cells can also be activated in vivo by making tumor cells express GM-CSF. This can be achieved by either genetically engineering tumor cells to produce GM-CSF or by infecting tumor cells with an oncolytic virus that expresses GM-CSF. Another strategy is to remove dendritic cells from the blood of a patient and activate them outside the body. The dendritic cells are activated in the presence of tumor antigens, which may be a single tumor-specific peptide/protein or a tumor cell lysate (a solution of broken down tumor cells). These cells (with optional adjuvants) are infused and provoke an immune response. Dendritic cell therapies include the use of antibodies that bind to receptors on the surface of dendritic cells. Antigens can be added to the antibody and can induce the dendritic cells to mature and provide immunity to the tumor. Dendritic cell receptors such as TLR3, TLR7, TLR8 or CD40 have been used as antibody targets. Dendritic cell-NK cell interface also has an important role in immunotherapy. The design of new dendritic cell-based vaccination strategies should also encompass NK cell-stimulating potency. It is critical to systematically incorporate NK cells monitoring as an outcome in antitumor DC-based clinical trials. Sipuleucel-T (Provenge) was approved for treatment of asymptomatic or minimally symptomatic metastatic castration-resistant prostate cancer in 2010. The treatment consists of removal of antigen presenting cells from blood by leukapheresis and growing them with the fusion protein PA2024 made from GM-CSF and prostate-specific prostatic acid phosphatase (PAP) and reinfused. This process is repeated three times. The premise of CAR-T immunotherapy is to modify T cells to recognize cancer cells in order to more effectively target and destroy them. Scientists harvest T cells from people, genetically alter them to add a chimeric antigen receptor (CAR) that specifically recognizes cancer cells, then infuse the resulting CAR-T cells into patients to attack their tumors. Tisagenlecleucel (Kymriah), a chimeric antigen receptor (CAR-T) therapy, was approved by FDA in 2017 to treat acute lymphoblastic leukemia (ALL). This treatment removes CD19 positive cells (B-cells) from the body (including the diseased cells, but also normal antibody producing cells). Axicabtagene ciloleucel (Yescarta) is another CAR-T therapeutic, approved in 2017 for treatment of diffuse large B-cell lymphoma (DLBCL). Many forms of antibodies can be engineered. Antibodies are a key component of the adaptive immune response, playing a central role in both recognizing foreign antigens and stimulating an immune response. Antibodies are Y-shaped proteins produced by some B cells and are composed of two regions: an antigen-binding fragment (Fab), which binds to antigens, and a Fragment crystallizable (Fc) region, which interacts with so-called Fc receptors that are expressed on the surface of different immune cell types including macrophages, neutrophils and NK cells. Many immunotherapeutic regimens involve antibodies. Monoclonal antibody technology engineers and generates antibodies against specific antigens, such as those present on tumor surfaces. These antibodies that are specific to the antigens of the tumor, can then be injected into a tumor. Naked monoclonal antibodies are antibodies without added elements. Most antibody therapies use this antibody type. Conjugated monoclonal antibodies are joined to another molecule, which is either cytotoxic or radioactive. The toxic chemicals are those typically used as chemotherapy drugs, but other toxins can be used. The antibody binds to specific antigens on cancer cell surfaces, directing the therapy to the tumor. Radioactive compound-linked antibodies are referred to as radiolabelled. Chemolabelled or immunotoxins antibodies are tagged with chemotherapeutic molecules or toxins, respectively. Fc's ability to bind Fc receptors is important because it allows antibodies to activate the immune system. Fc regions are varied: they exist in numerous subtypes and can be further modified, for example with the addition of sugars in a process called glycosylation. Changes in the Fc region can alter an antibody's ability to engage Fc receptors and, by extension, will determine the type of immune response that the antibody triggers. Many cancer immunotherapy drugs, including PD-1 and PD-L1 inhibitors, are antibodies. For example, immune checkpoint blockers targeting PD-1 are antibodies designed to bind PD-1 expressed by T cells and reactivate these cells to eliminate tumors. Anti-PD-1 drugs contain not only an Fab region that binds PD-1 but also an Fc region. Experimental work indicates that the Fc portion of cancer immunotherapy drugs can affect the outcome of treatment. For example, anti-PD-1 drugs with Fc regions that bind inhibitory Fc receptors can have decreased therapeutic efficacy. Imaging studies have further shown that the Fc region of anti-PD-1 drugs can bind Fc receptors expressed by tumor-associated macrophages. This process removes the drugs from their intended targets (i.e. PD-1 molecules expressed on the surface of T cells) and limits therapeutic efficacy. Furthermore, antibodies targeting the co-stimulatory protein CD40 require engagement with selective Fc receptors for optimal therapeutic efficacy. Together, these studies underscore the importance of Fc status in antibody-based immune checkpoint targeting strategies. Antibodies are also referred to as murine, chimeric, humanized and human. Murine antibodies are from a different species and carry a risk of immune reaction. Chimeric antibodies attempt to reduce murine antibodies' immunogenicity by replacing part of the antibody with the corresponding human counterpart, known as the constant region. Humanized antibodies are almost completely human; only the complementarity determining regions of the variable regions are derived from murine sources. Human antibodies have been produced using unmodified human DNA. Antibody-dependent cell-mediated cytotoxicity. When the Fc receptors on natural killer (NK) cells interact with Fc regions of antibodies bound to cancer cells, the NK cell releases perforin and granzyme, leading to cancer cell apoptosis. Antibody-dependent cell-mediated cytotoxicity (ADCC) requires antibodies to bind to target cell surfaces. Antibodies are formed of a binding region (Fab) and the Fc region that can be detected by immune system cells via their Fc surface receptors. Fc receptors are found on many immune system cells, including NK cells. When NK cells encounter antibody-coated cells, the latter's Fc regions interact with their Fc receptors, releasing perforin and granzyme B to kill the tumor cell. Examples include Rituximab, Ofatumumab and Alemtuzumab. Antibodies under development have altered Fc regions that have higher affinity for a specific type of Fc receptor, FcγRIIIA, which can dramatically increase effectiveness. The complement system includes blood proteins that can cause cell death after an antibody binds to the cell surface (the classical complement pathway, among the ways of complement activation). Generally the system deals with foreign pathogens, but can be activated with therapeutic antibodies in cancer. 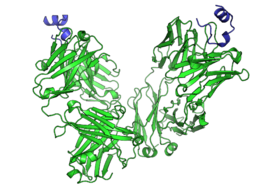 The system can be triggered if the antibody is chimeric, humanized or human; as long as it contains the IgG1 Fc region. Complement can lead to cell death by activation of the membrane attack complex, known as complement-dependent cytotoxicity; enhancement of antibody-dependent cell-mediated cytotoxicity; and CR3-dependent cellular cytotoxicity. Complement-dependent cytotoxicity occurs when antibodies bind to the cancer cell surface, the C1 complex binds to these antibodies and subsequently protein pores are formed in the cancer cell membrane. Alemtuzumab (Campath-1H) is an anti-CD52 humanized IgG1 monoclonal antibody indicated for the treatment of fludarabine-refractory chronic lymphocytic leukemia (CLL), cutaneous T-cell lymphoma, peripheral T-cell lymphoma and T-cell prolymphocytic leukemia. CD52 is found on >95% of peripheral blood lymphocytes (both T-cells and B-cells) and monocytes, but its function in lymphocytes is unknown. It binds to CD52 and initiates its cytotoxic effect by complement fixation and ADCC mechanisms. Due to the antibody target (cells of the immune system) common complications of alemtuzumab therapy are infection, toxicity and myelosuppression. have disease progression during or following platinum-containing chemotherapy. have disease progression within 12 months of neoadjuvant or adjuvant treatment with platinum-containing chemotherapy. Ipilimumab (Yervoy) is a human IgG1 antibody that binds the surface protein CTLA4. In normal physiology T-cells are activated by two signals: the T-cell receptor binding to an antigen-MHC complex and T-cell surface receptor CD28 binding to CD80 or CD86 proteins. CTLA4 binds to CD80 or CD86, preventing the binding of CD28 to these surface proteins and therefore negatively regulates the activation of T-cells. Active cytotoxic T-cells are required for the immune system to attack melanoma cells. Normally inhibited active melanoma-specific cytotoxic T-cells can produce an effective anti-tumor response. Ipilumumab can cause a shift in the ratio of regulatory T-cells to cytotoxic T-cells to increase the anti-tumor response. Regulatory T-cells inhibit other T-cells, which may benefit the tumor. Ofatumumab is a second generation human IgG1 antibody that binds to CD20. It is used in the treatment of chronic lymphocytic leukemia (CLL) because the cancerous cells of CLL are usually CD20-expressing B-cells. Unlike rituximab, which binds to a large loop of the CD20 protein, ofatumumab binds to a separate, small loop. This may explain their different characteristics. Compared to rituximab, ofatumumab induces complement-dependent cytotoxicity at a lower dose with less immunogenicity. As of 2019, pembrolizumab, which blocks PD-1, programmed cell death protein 1, has been used via intravenous infusion to treat inoperable or metastatic melanoma, metastatic non-small cell lung cancer (NSCLC) in certain situations, as a second-line treatment for head and neck squamous cell carcinoma (HNSCC), after platinum-based chemotherapy, and for the treatment of adult and pediatric patients with refractory classic Hodgkin's lymphoma (cHL). It is also indicated for certain patients with urothelial carcinoma, stomach cancer and cervical cancer. Rituximab is a chimeric monoclonal IgG1 antibody specific for CD20, developed from its parent antibody Ibritumomab. As with ibritumomab, rituximab targets CD20, making it effective in treating certain B-cell malignancies. These include aggressive and indolent lymphomas such as diffuse large B-cell lymphoma and follicular lymphoma and leukemias such as B-cell chronic lymphocytic leukemia. Although the function of CD20 is relatively unknown, CD20 may be a calcium channel involved in B-cell activation. The antibody's mode of action is primarily through the induction of ADCC and complement-mediated cytotoxicity. Other mechanisms include apoptosis[clarification needed] and cellular growth arrest. Rituximab also increases the sensitivity of cancerous B-cells to chemotherapy. Cytokines are proteins produced by many types of cells present within a tumor. They can modulate immune responses. The tumor often employs them to allow it to grow and reduce the immune response. These immune-modulating effects allow them to be used as drugs to provoke an immune response. Two commonly used cytokines are interferons and interleukins. Interleukin-2 and interferon-α are cytokines, proteins that regulate and coordinate the behavior of the immune system. They have the ability to enhance anti-tumor activity and thus can be used as passive cancer treatments. Interferon-α is used in the treatment of hairy-cell leukaemia, AIDS-related Kaposi's sarcoma, follicular lymphoma, chronic myeloid leukaemia and malignant melanoma. Interleukin-2 is used in the treatment of malignant melanoma and renal cell carcinoma. Interferons are produced by the immune system. They are usually involved in anti-viral response, but also have use for cancer. They fall in three groups: type I (IFNα and IFNβ), type II (IFNγ) and type III (IFNλ). IFNα has been approved for use in hairy-cell leukaemia, AIDS-related Kaposi's sarcoma, follicular lymphoma, chronic myeloid leukaemia and melanoma. Type I and II IFNs have been researched extensively and although both types promote anti-tumor immune system effects, only type I IFNs have been shown to be clinically effective. IFNλ shows promise for its anti-tumor effects in animal models. Unlike type I IFNs, Interferon gamma is not approved yet for the treatment of any cancer. However, improved survival was observed when Interferon gamma was administrated to patients with bladder carcinoma and melanoma cancers. The most promising result was achieved in patients with stage 2 and 3 of ovarian carcinoma.The in vitro study of IFN-gamma in cancer cells is more extensive and results indicate anti-proliferative activity of IFN-gamma leading to the growth inhibition or cell death, generally induced by apoptosis but sometimes by autophagy. Interleukins have an array of immune system effects. Interleukin-2 is used in the treatment of malignant melanoma and renal cell carcinoma. In normal physiology it promotes both effector T cells and T-regulatory cells, but its exact mechanism of action is unknown. Combining various immunotherapies such as PD1 and CTLA4 inhibitors can enhance anti-tumor response leading to durable responses. Combining ablation therapy of tumors with immunotherapy enhances the immunostimulating response and has synergistic effects for curative metastatic cancer treatment. Combining checkpoint immunotherapies with pharmaceutical agents has the potential to improve response, and such combination therapies are a highly investigated area of clinical investigation. Immunostimulatory drugs such as CSF-1R inhibitors and TLR agonists have been particularly effective in this setting. Japan's Ministry of Health, Labour and Welfare approved the use of polysaccharide-K extracted from the mushroom, Coriolus versicolor, in the 1980s, to stimulate the immune systems of patients undergoing chemotherapy. It is a dietary supplement in the US and other jurisdictions. Because of the high cost of many of the immunotherapy medications and the reluctance of medical insurance companies to prepay for their prescriptions various test methods have been proposed, to attempt to forecast the effectiveness of these medications. The detection of PD-L1 protein seemed to be an indication of cancer susceptible to several immunotherapy medications, but research found that both the lack of this protein or its inclusion in the cancerous tissue was inconclusive, due to the little-understood varying quantities of the protein during different times and locations within the infected cells and tissue. In 2018 some genetic indications such as Tumor Mutational Burden (TMB, the number of mutations within a targeted genetic region in the cancerous cell's DNA), and Microsatellite instability (MSI, the quantity of impaired DNA mismatch leading to probable mutations), have been approved by the FDA as good indicators for the probability of effective treatment of immunotherapy medication for certain cancers, but research is still in progress. In some cases the FDA has approved genetic tests for medication that is specific to certain genetic markers. For example, the FDA approved BRAF associated medication for metastatic melanoma, to be administered to patients after testing for the BRAF genetic mutation. Tests of this sort are being widely advertised for general cancer treatment and are expensive. In the past, some genetic testing for cancer treatment has been involved in scams such as the Duke University Cancer Fraud scandal, or claimed to be hoaxes. Cancer specific T-cells can be obtained by fragmentation and isolation of tumour infiltrating lymphocytes, or by genetically engineering cells from peripheral blood. The cells are activated and grown prior to transfusion into the recipient (tumor bearer). Adoptive T cell therapy is a form of passive immunization by the transfusion of T-cells (adoptive cell transfer). They are found in blood and tissue and usually activate when they find foreign pathogens. Specifically they activate when the T-cell's surface receptors encounter cells that display parts of foreign proteins on their surface antigens. These can be either infected cells, or antigen presenting cells (APCs). They are found in normal tissue and in tumor tissue, where they are known as tumor infiltrating lymphocytes (TILs). They are activated by the presence of APCs such as dendritic cells that present tumor antigens. Although these cells can attack the tumor, the environment within the tumor is highly immunosuppressive, preventing immune-mediated tumour death. Multiple ways of producing and obtaining tumour targeted T-cells have been developed. T-cells specific to a tumor antigen can be removed from a tumor sample (TILs) or filtered from blood. Subsequent activation and culturing is performed ex vivo, with the results reinfused. Activation can take place through gene therapy, or by exposing the T cells to tumor antigens. As of 2014, multiple ACT clinical trials were underway. Importantly, one study from 2018 showed that clinical responses can be obtained in patients with metastatic melanoma resistant to multiple previous immunotherapies. The first 2 adoptive T-cell therapies, tisagenlecleucel and axicabtagene ciloleucel, were approved by the FDA in 2017. Another approach is adoptive transfer of haploidentical γδ T cells or NK cells from a healthy donor. The major advantage of this approach is that these cells do not cause GVHD. The disadvantage is frequently impaired function of the transferred cells. Many tumor cells overexpress CD47 to escape immunosurveilance of host immune system. CD47 binds to its receptor signal regulatory protein alpha (SIRPα) and downregulate phagocytosis of tumor cell. Therefore, anti-CD47 therapy aims to restore clearance of tumor cells. Additionally, growing evidence supports the employment of tumor antigen-specific T cell response in response to anti-CD47 therapy. A number of therapeutics is being developed, including anti-CD47 antibodies, engineered decoy receptors, anti-SIRPα antibodies and bispecific agents. As of 2017, wide range of solid and hematologic malignancies were being clinically tested. Carbohydrate antigens on the surface of cells can be used as targets for immunotherapy. GD2 is a ganglioside found on the surface of many types of cancer cell including neuroblastoma, retinoblastoma, melanoma, small cell lung cancer, brain tumors, osteosarcoma, rhabdomyosarcoma, Ewing's sarcoma, liposarcoma, fibrosarcoma, leiomyosarcoma and other soft tissue sarcomas. It is not usually expressed on the surface of normal tissues, making it a good target for immunotherapy. As of 2014, clinical trials were underway. Immune checkpoints affect immune system function. Immune checkpoints can be stimulatory or inhibitory. Tumors can use these checkpoints to protect themselves from immune system attacks. Currently approved checkpoint therapies block inhibitory checkpoint receptors. Blockade of negative feedback signaling to immune cells thus results in an enhanced immune response against tumors. One ligand-receptor interaction under investigation is the interaction between the transmembrane programmed cell death 1 protein (PDCD1, PD-1; also known as CD279) and its ligand, PD-1 ligand 1 (PD-L1, CD274). PD-L1 on the cell surface binds to PD1 on an immune cell surface, which inhibits immune cell activity. Among PD-L1 functions is a key regulatory role on T cell activities. It appears that (cancer-mediated) upregulation of PD-L1 on the cell surface may inhibit T cells that might otherwise attack. PD-L1 on cancer cells also inhibits FAS- and interferon-dependent apoptosis, protecting cells from cytotoxic molecules produced by T cells. Antibodies that bind to either PD-1 or PD-L1 and therefore block the interaction may allow the T-cells to attack the tumor. The first checkpoint antibody approved by the FDA was ipilimumab, approved in 2011 for treatment of melanoma. It blocks the immune checkpoint molecule CTLA-4. Clinical trials have also shown some benefits of anti-CTLA-4 therapy on lung cancer or pancreatic cancer, specifically in combination with other drugs. In on-going trials the combination of CTLA-4 blockade with PD-1 or PD-L1 inhibitors is tested on different types of cancer. However, patients treated with check-point blockade (specifically CTLA-4 blocking antibodies), or a combination of check-point blocking antibodies, are at high risk of suffering from immune-related adverse events such as dermatologic, gastrointestinal, endocrine, or hepatic autoimmune reactions. These are most likely due to the breadth of the induced T-cell activation when anti-CTLA-4 antibodies are administered by injection in the blood stream. Using a mouse model of bladder cancer, researchers have found that a local injection of a low dose anti-CTLA-4 in the tumour area had the same tumour inhibiting capacity as when the antibody was delivered in the blood. At the same time the levels of circulating antibodies were lower, suggesting that local administration of the anti-CTLA-4 therapy might result in fewer adverse events. Initial clinical trial results with IgG4 PD1 antibody Nivolumab were published in 2010. It was approved in 2014. Nivolumab is approved to treat melanoma, lung cancer, kidney cancer, bladder cancer, head and neck cancer, and Hodgkin's lymphoma. A 2016 clinical trial for non-small cell lung cancer failed to meet its primary endpoint for treatment in the first line setting, but is FDA approved in subsequent lines of therapy. Pembrolizumab is another PD1 inhibitor that was approved by the FDA in 2014. Keytruda (Pembrolizumab) is approved to treat melanoma and lung cancer. Antibody BGB-A317 is a PD-1 inhibitor (designed to not bind Fc gamma receptor I) in early clinical trials. In May 2016, PD-L1 inhibitor atezolizumab was approved for treating bladder cancer. Anti-PD-L1 antibodies currently in development include avelumab and durvalumab, in addition to an affimer biotherapeutic. Other modes of enhancing [adoptive] immuno-therapy include targeting so-called intrinsic checkpoint blockades e.g. CISH. A number of cancer patients do not respond to immune checkpoint blockade. Response rate may be improved by combining immune checkpoint blockade with additional rationally selected anticancer therapies (out of which some may stimulate T cell infiltration into tumors). For example, targeted therapies such, radiotherapy, vasculature targeting agents, and immunogenic chemotherapy can improve immune checkpoint blockade response in animal models of cancer. An oncolytic virus is a virus that preferentially infects and kills cancer cells. As the infected cancer cells are destroyed by oncolysis, they release new infectious virus particles or virions to help destroy the remaining tumour. Oncolytic viruses are thought not only to cause direct destruction of the tumour cells, but also to stimulate host anti-tumour immune responses for long-term immunotherapy. The potential of viruses as anti-cancer agents was first realized in the early twentieth century, although coordinated research efforts did not begin until the 1960s. A number of viruses including adenovirus, reovirus, measles, herpes simplex, Newcastle disease virus and vaccinia have now been clinically tested as oncolytic agents. T-Vec is the first FDA-approved oncolytic virus for the treatment of melanoma. A number of other oncolytic viruses are in Phase II-III development. Certain compounds found in mushrooms, primarily polysaccharides, can up-regulate the immune system and may have anti-cancer properties. For example, beta-glucans such as lentinan have been shown in laboratory studies to stimulate macrophage, NK cells, T cells and immune system cytokines and have been investigated in clinical trials as immunologic adjuvants. Many tumors express mutations. These mutations potentially create new targetable antigens (neoantigens) for use in T cell immunotherapy. The presence of CD8+ T cells in cancer lesions, as identified using RNA sequencing data, is higher in tumors with a high mutational burden. The level of transcripts associated with cytolytic activity of natural killer cells and T cells positively correlates with mutational load in many human tumors. In non–small cell lung cancer patients treated with lambrolizumab, mutational load shows a strong correlation with clinical response. In melanoma patients treated with ipilimumab, long-term benefit is also associated with a higher mutational load, although less significantly. The predicted MHC binding neoantigens in patients with a long-term clinical benefit were enriched for a series of tetrapeptide motifs that were not found in tumors of patients with no or minimal clinical benefit. However, human neoantigens identified in other studies do not show the bias toward tetrapeptide signatures. ^ Korneev KV, Atretkhany KN, Drutskaya MS, Grivennikov SI, Kuprash DV, Nedospasov SA (January 2017). "TLR-signaling and proinflammatory cytokines as drivers of tumorigenesis". Cytokine. 89: 127–35. doi:10.1016/j.cyto.2016.01.021. PMID 26854213. ^ Riddell SR (July 2001). "Progress in cancer vaccines by enhanced self-presentation". Proceedings of the National Academy of Sciences of the United States of America. 98 (16): 8933–35. Bibcode:2001PNAS...98.8933R. doi:10.1073/pnas.171326398. PMC 55350. PMID 11481463. ^ a b Palucka K, Banchereau J (July 2013). "Dendritic-cell-based therapeutic cancer vaccines". Immunity. 39 (1): 38–48. doi:10.1016/j.immuni.2013.07.004. PMC 3788678. PMID 23890062. ^ Hirayama M, Nishimura Y (July 2016). "The present status and future prospects of peptide-based cancer vaccines". International Immunology. 28 (7): 319–28. doi:10.1093/intimm/dxw027. PMID 27235694. ^ Dastmalchi F, Karachi A, Mitchell D, Rahman M (2018). Dendritic Cell Therapy. eLS. American Cancer Society. pp. 1–27. doi:10.1002/9780470015902.a0024243. ISBN 9780470015902. ^ Calmeiro J, Carrascal M, Gomes C, Falcão A, Cruz MT, Neves BM (November 2018). "Highlighting the Role of DC-NK Cell Interplay in Immunobiology and Immunotherapy". Dendritic Cells, Intech. doi:10.5772/intechopen.78804. ^ Gardner TA, Elzey BD, Hahn NM (April 2012). "Sipuleucel-T (Provenge) autologous vaccine approved for treatment of men with asymptomatic or minimally symptomatic castrate-resistant metastatic prostate cancer". Human Vaccines & Immunotherapeutics. 8 (4): 534–39. doi:10.4161/hv.19795. PMID 22832254. ^ Oudard S (May 2013). "Progress in emerging therapies for advanced prostate cancer". Cancer Treatment Reviews. 39 (3): 275–89. doi:10.1016/j.ctrv.2012.09.005. PMID 23107383. ^ Sims RB (June 2012). "Development of sipuleucel-T: autologous cellular immunotherapy for the treatment of metastatic castrate resistant prostate cancer". Vaccine. 30 (29): 4394–97. doi:10.1016/j.vaccine.2011.11.058. PMID 22122856. ^ Shore ND, Mantz CA, Dosoretz DE, Fernandez E, Myslicki FA, McCoy C, Finkelstein SE, Fishman MN (January 2013). "Building on sipuleucel-T for immunologic treatment of castration-resistant prostate cancer". Cancer Control. 20 (1): 7–16. doi:10.1177/107327481302000103. PMID 23302902. ^ Commissioner, Office of the. "Press Announcements – FDA approval brings first gene therapy to the United States". fda.gov. Retrieved 13 December 2017. ^ a b "FDA approves CAR-T cell therapy to treat adults with certain types of large B-cell lymphoma". fda.gov. 18 October 2017. Retrieved 8 November 2017. ^ a b Scott AM, Wolchok JD, Old LJ (March 2012). "Antibody therapy of cancer". Nature Reviews. Cancer. 12 (4): 278–87. doi:10.1038/nrc3236. PMID 22437872. ^ a b Harding FA, Stickler MM, Razo J, DuBridge RB (May – June 2010). "The immunogenicity of humanized and fully human antibodies: residual immunogenicity resides in the CDR regions". MAbs. 2 (3): 256–65. doi:10.4161/mabs.2.3.11641. PMC 2881252. PMID 20400861. ^ Pincetic A, Bournazos S, DiLillo DJ, Maamary J, Wang TT, Dahan R, Fiebiger BM, Ravetch JV (August 2014). "Type I and type II Fc receptors regulate innate and adaptive immunity". Nature Immunology. 15 (8): 707–16. doi:10.1038/ni.2939. PMID 25045879. ^ Topalian SL, Hodi FS, Brahmer JR, Gettinger SN, Smith DC, McDermott DF, Powderly JD, Carvajal RD, Sosman JA, Atkins MB, Leming PD, Spigel DR, Antonia SJ, Horn L, Drake CG, Pardoll DM, Chen L, Sharfman WH, Anders RA, Taube JM, McMiller TL, Xu H, Korman AJ, Jure-Kunkel M, Agrawal S, McDonald D, Kollia GD, Gupta A, Wigginton JM, Sznol M (June 2012). "Safety, activity, and immune correlates of anti-PD-1 antibody in cancer". The New England Journal of Medicine. 366 (26): 2443–54. doi:10.1056/NEJMoa1200690. PMC 3544539. PMID 22658127. ^ Dahan R, Sega E, Engelhardt J, Selby M, Korman AJ, Ravetch JV (October 2015). "FcγRs Modulate the Anti-tumor Activity of Antibodies Targeting the PD-1/PD-L1 Axis". Cancer Cell. 28 (4): 543. doi:10.1016/j.ccell.2015.09.011. PMID 28854351. ^ Arlauckas SP, Garris CS, Kohler RH, Kitaoka M, Cuccarese MF, Yang KS, Miller MA, Carlson JC, Freeman GJ, Anthony RM, Weissleder R, Pittet MJ (May 2017). "In vivo imaging reveals a tumor-associated macrophage-mediated resistance pathway in anti-PD-1 therapy". Science Translational Medicine. 9 (389): eaal3604. doi:10.1126/scitranslmed.aal3604. PMC 5734617. PMID 28490665. ^ Dahan R, Barnhart BC, Li F, Yamniuk AP, Korman AJ, Ravetch JV (July 2016). "Therapeutic Activity of Agonistic, Human Anti-CD40 Monoclonal Antibodies Requires Selective FcγR Engagement". Cancer Cell. 29 (6): 820–31. doi:10.1016/j.ccell.2016.05.001. PMC 4975533. PMID 27265505. ^ Weiner LM, Surana R, Wang S (May 2010). "Monoclonal antibodies: versatile platforms for cancer immunotherapy". Nature Reviews. Immunology. 10 (5): 317–27. doi:10.1038/nri2744. PMC 3508064. PMID 20414205. ^ Seidel UJ, Schlegel P, Lang P (2013). "Natural killer cell mediated antibody-dependent cellular cytotoxicity in tumor immunotherapy with therapeutic antibodies". Frontiers in Immunology. 4: 76. doi:10.3389/fimmu.2013.00076. PMC 3608903. PMID 23543707. ^ Gelderman KA, Tomlinson S, Ross GD, Gorter A (March 2004). "Complement function in mAb-mediated cancer immunotherapy". Trends in Immunology. 25 (3): 158–64. doi:10.1016/j.it.2004.01.008. PMID 15036044. ^ Waldmann TA (March 2003). "Immunotherapy: past, present and future". Nature Medicine. 9 (3): 269–77. doi:10.1038/nm0303-269. PMID 12612576. ^ Demko S, Summers J, Keegan P, Pazdur R (February 2008). "FDA drug approval summary: alemtuzumab as single-agent treatment for B-cell chronic lymphocytic leukemia". The Oncologist. 13 (2): 167–74. doi:10.1634/theoncologist.2007-0218. PMID 18305062. ^ "FDA approves new, targeted treatment for bladder cancer". FDA. 18 May 2016. Retrieved 20 May 2016. ^ "US Food and Drug Administration – Avelumab Prescribing Label" (PDF). ^ Pazdur R. "FDA approval for Ipilimumab". Retrieved 7 November 2013. ^ Lemery SJ, Zhang J, Rothmann MD, Yang J, Earp J, Zhao H, McDougal A, Pilaro A, Chiang R, Gootenberg JE, Keegan P, Pazdur R (September 2010). "U.S. Food and Drug Administration approval: ofatumumab for the treatment of patients with chronic lymphocytic leukemia refractory to fludarabine and alemtuzumab". Clinical Cancer Research. 16 (17): 4331–38. doi:10.1158/1078-0432.CCR-10-0570. PMID 20601446. ^ Sharma P, Allison JP (April 2015). "The future of immune checkpoint therapy". Science. 348 (6230): 56–61. Bibcode:2015Sci...348...56S. doi:10.1126/science.aaa8172. PMID 25838373. ^ "Opdivo Drug Approval History". ^ "FDA approves pembrolizumab in combination with chemotherapy for first-line treatment of metastatic squamous NSCLC". ^ "Pembrolizumab (KEYTRUDA) for classical Hodgkin lymphoma". ^ "FDA approves pembrolizumab for Merkel cell carcinoma". ^ "FDA approves pembrolizumab for treatment of relapsed or refractory PMBCL". ^ "National Cancer Institute - Pembrolizumab Use in Cancer". ^ James JS, Dubs G (December 1997). "FDA approves new kind of lymphoma treatment. Food and Drug Administration". AIDS Treatment News (284): 2–3. PMID 11364912. ^ Research, Center for Drug Evaluation and. "Approved Drugs – Durvalumab (Imfinzi)". fda.gov. Retrieved 6 May 2017. ^ "FDA approves durvalumab after chemoradiation for unresectable stage III NSCLC". ^ Byrd JC, Stilgenbauer S, Flinn IW (2004). "Chronic Lymphocytic Leukemia". ASH Education Program Book. Am Soc Hematol Educ Program. pp. 163–183. doi:10.1182/asheducation-2004.1.163. ^ Domagała A, Kurpisz M (March – April 2001). "CD52 antigen – a review". Medical Science Monitor. 7 (2): 325–31. PMID 11257744. ^ Dearden C (July 2012). "How I treat prolymphocytic leukemia". Blood. 120 (3): 538–51. doi:10.1182/blood-2012-01-380139. PMID 22649104. ^ a b Sondak VK, Smalley KS, Kudchadkar R, Grippon S, Kirkpatrick P (June 2011). "Ipilimumab". Nature Reviews. Drug Discovery. 10 (6): 411–12. doi:10.1038/nrd3463. PMID 21629286. ^ a b Lipson EJ, Drake CG (November 2011). "Ipilimumab: an anti-CTLA-4 antibody for metastatic melanoma". Clinical Cancer Research. 17 (22): 6958–62. doi:10.1158/1078-0432.CCR-11-1595. PMC 3575079. PMID 21900389. ^ a b Thumar JR, Kluger HM (December 2010). "Ipilimumab: a promising immunotherapy for melanoma". Oncology. 24 (14): 1280–88. PMID 21294471. ^ a b Chambers CA, Kuhns MS, Egen JG, Allison JP (2001). "CTLA-4-mediated inhibition in regulation of T cell responses: mechanisms and manipulation in tumor immunotherapy". Annual Review of Immunology. 19: 565–94. doi:10.1146/annurev.immunol.19.1.565. PMID 11244047. ^ Castillo J, Perez K (2010). "The role of ofatumumab in the treatment of chronic lymphocytic leukemia resistant to previous therapies". Journal of Blood Medicine. 1: 1–8. doi:10.2147/jbm.s7284. PMC 3262337. PMID 22282677. ^ Zhang B (July – August 2009). "Ofatumumab". MAbs. 1 (4): 326–31. doi:10.4161/mabs.1.4.8895. PMC 2726602. PMID 20068404. ^ "Pembrolizumab label at eMC". UK Electronic Medicines Compendium. 27 January 2017. ^ "HIGHLIGHTS OF PRESCRIBING INFORMATION - KEYTRUDA (Pembrolizumab)" (PDF). fda.gov. June 2018. Retrieved 27 February 2019. ^ Keating GM (July 2010). "Rituximab: a review of its use in chronic lymphocytic leukaemia, low-grade or follicular lymphoma and diffuse large B-cell lymphoma". Drugs. 70 (11): 1445–76. doi:10.2165/11201110-000000000-00000. PMID 20614951. ^ a b Plosker GL, Figgitt DP (2003). "Rituximab: a review of its use in non-Hodgkin's lymphoma and chronic lymphocytic leukaemia". Drugs. 63 (8): 803–43. doi:10.2165/00003495-200363080-00005. PMID 12662126. ^ Cerny T, Borisch B, Introna M, Johnson P, Rose AL (November 2002). "Mechanism of action of rituximab". Anti-Cancer Drugs. 13 Suppl 2: S3–10. doi:10.1097/00001813-200211002-00002. PMID 12710585. ^ Weiner GJ (April 2010). "Rituximab: mechanism of action". Seminars in Hematology. 47 (2): 115–23. doi:10.1053/j.seminhematol.2010.01.011. PMC 2848172. PMID 20350658. ^ a b Dranoff G (January 2004). "Cytokines in cancer pathogenesis and cancer therapy". Nature Reviews. Cancer. 4 (1): 11–22. doi:10.1038/nrc1252. PMID 14708024. ^ Dunn GP, Koebel CM, Schreiber RD (November 2006). "Interferons, immunity and cancer immunoediting". Nature Reviews. Immunology. 6 (11): 836–48. doi:10.1038/nri1961. PMID 17063185. ^ Lasfar A, Abushahba W, Balan M, Cohen-Solal KA (2011). "Interferon lambda: a new sword in cancer immunotherapy". Clinical & Developmental Immunology. 2011: 349575. doi:10.1155/2011/349575. PMC 3235441. PMID 22190970. ^ Razaghi A, Owens L, Heimann K (December 2016). "Review of the recombinant human interferon gamma as an immunotherapeutic: Impacts of production platforms and glycosylation". Journal of Biotechnology. 240: 48–60. doi:10.1016/j.jbiotec.2016.10.022. PMID 27794496. ^ Coventry BJ, Ashdown ML (2012). "The 20th anniversary of interleukin-2 therapy: bimodal role explaining longstanding random induction of complete clinical responses". Cancer Management and Research. 4: 215–21. doi:10.2147/cmar.s33979. PMC 3421468. PMID 22904643. ^ Ott PA, Hodi FS, Kaufman HL, Wigginton JM, Wolchok JD (2017). "Combination immunotherapy: a road map". Journal for Immunotherapy of Cancer. 5: 16. doi:10.1186/s40425-017-0218-5. PMC 5319100. PMID 28239469. ^ Mahoney KM, Rennert PD, Freeman GJ (August 2015). "Combination cancer immunotherapy and new immunomodulatory targets". Nature Reviews. Drug Discovery. 14 (8): 561–84. doi:10.1038/nrd4591. PMID 26228759. ^ "Thermal Ablative Therapies and Immune Checkpoint Modulation: Can Locoregional Approaches Effect a Systemic Response?". 2015. ^ Tang J, Shalabi A, Hubbard-Lucey VM (January 2018). "Comprehensive analysis of the clinical immuno-oncology landscape". Annals of Oncology. 29 (1): 84–91. doi:10.1093/annonc/mdx755. PMID 29228097. ^ Perry CJ, Muñoz-Rojas AR, Meeth KM, Kellman LN, Amezquita RA, Thakral D, Du VY, Wang JX, Damsky W, Kuhlmann AL, Sher JW, Bosenberg M, Miller-Jensen K, Kaech SM (March 2018). "Myeloid-targeted immunotherapies act in synergy to induce inflammation and antitumor immunity". The Journal of Experimental Medicine. 215 (3): 877–93. doi:10.1084/jem.20171435. PMID 29436395. ^ Rodell CB, Arlauckas SP, Cuccarese MF, Garris CS, Li R, Ahmed MS, Kohler RH, Pittet MJ, Weissleder R (21 May 2018). "TLR7/8-agonist-loaded nanoparticles promote the polarization of tumour-associated macrophages to enhance cancer immunotherapy". Nature Biomedical Engineering. doi:10.1038/s41551-018-0236-8. ^ "Coriolus Versicolor". American Cancer Society. Archived from the original on 15 February 2006. ^ "Cancer Genetics offers the FDA-approved DAKO PD-L1 IHC 22C3 pharmDx companion diagnostic test for KEYTRUDA®". 3 February 2016. ^ Udall M, Rizzo M, Kenny J, Doherty J, Dahm S, Robbins P, Faulkner E (February 2018). "PD-L1 diagnostic tests: a systematic literature review of scoring algorithms and test-validation metrics". Diagnostic Pathology. 13 (1): 12. doi:10.1186/s13000-018-0689-9. PMC 5807740. PMID 29426340. ^ Dacic S (April 2018). "Time is up for PD-L1 testing standardization in lung cancer". Annals of Oncology. 29 (4): 791–792. doi:10.1093/annonc/mdy069. PMID 29688334. ^ Goodman AM, Kato S, Bazhenova L, Patel SP, Frampton GM, Miller V, Stephens PJ, Daniels GA, Kurzrock R (November 2017). "Tumor Mutational Burden as an Independent Predictor of Response to Immunotherapy in Diverse Cancers". Molecular Cancer Therapeutics. 16 (11): 2598–2608. doi:10.1158/1535-7163.MCT-17-0386. PMC 5670009. PMID 28835386. ^ "FDA Accepts sBLA for First-Line Nivolumab Plus Low-Dose Ipilimumab in NSCLC With Tumor Mutational Burden ≥ 10 mut/mb". ASCO Post. American Society of Clinical Oncology. 7 February 2018. ^ "FDA approves Encorafenib and Binimetinib in combination for unresectable or metastatic melanoma with BRAF mutations". U.S. Food and Drug Administration. 27 June 2018. ^ A public discussion by cancer patients from 2011 on the melanoma.org website shows costs and claims. ^ Restifo NP, Dudley ME, Rosenberg SA (March 2012). "Adoptive immunotherapy for cancer: harnessing the T cell response". Nature Reviews. Immunology. 12 (4): 269–81. doi:10.1038/nri3191. PMID 22437939. ^ Carroll J (December 2013). "Novartis/Penn's customized T cell wows ASH with stellar leukemia data". Fierce Biotech. ^ Carroll, John (February 2014). "Servier stages an entry into high-stakes CAR-T showdown with Novartis". FierceBiotech. ^ Regalado A (June 2015). "Biotech's Coming Cancer Cure: Supercharge your immune cells to defeat cancer? Juno Therapeutics believes its treatments can do exactly that". MIT Technology Review. ^ "CAR T-Cell Therapy: Engineering Patients' Immune Cells to Treat Their Cancers". cancer.gov. 6 December 2013. Retrieved 9 May 2014. ^ "NIH study demonstrates that a new cancer immunotherapy method could be effective against a wide range of cancers". nih.gov. 8 May 2014. Retrieved 9 May 2014. ^ Andersen R, Borch TH, Draghi A, Gokuldass A, Rana MA, Pedersen M, Nielsen M, Kongsted P, Kjeldsen JW, Westergaard MC, Radic HD, Chamberlain CA, Holmich LR, Hendel HW, Larsen MS, Met O, Svane IM, Donia M (April 2018). "T cells isolated from patients with checkpoint inhibitor resistant-melanoma are functional and can mediate tumor regression". Ann. Oncol. doi:10.1093/annonc/mdy139. PMID 29688262. ^ "FDA approval brings first gene therapy to the United States". fda.gov. 30 August 2017. Retrieved 8 November 2017. ^ Wilhelm M, Smetak M, Schaefer-Eckart K, Kimmel B, Birkmann J, Einsele H, Kunzmann V (February 2014). "Successful adoptive transfer and in vivo expansion of haploidentical γδ T cells". Journal of Translational Medicine. 12: 45. doi:10.1186/1479-5876-12-45. PMC 3926263. PMID 24528541. ^ Jaiswal S, Chao MP, Majeti R, Weissman IL (June 2010). "Macrophages as mediators of tumor immunosurveillance". Trends in Immunology. 31 (6): 212–19. doi:10.1016/j.it.2010.04.001. PMC 3646798. PMID 20452821. ^ a b c Weiskopf K (May 2017). "Cancer immunotherapy targeting the CD47/SIRPα axis". European Journal of Cancer. 76: 100–09. doi:10.1016/j.ejca.2017.02.013. PMID 28286286. ^ Matlung HL, Szilagyi K, Barclay NA, van den Berg TK (March 2017). "The CD47-SIRPα signaling axis as an innate immune checkpoint in cancer". Immunological Reviews. 276 (1): 145–64. doi:10.1111/imr.12527. PMID 28258703. ^ Veillette A, Chen J (March 2018). "SIRPα-CD47 Immune Checkpoint Blockade in Anticancer Therapy". Trends in Immunology. 39 (3): 173–84. doi:10.1016/j.it.2017.12.005. PMID 29336991. ^ Ahmed M, Cheung NK (January 2014). "Engineering anti-GD2 monoclonal antibodies for cancer immunotherapy". FEBS Letters. 588 (2): 288–97. doi:10.1016/j.febslet.2013.11.030. PMID 24295643. ^ a b Pardoll DM (March 2012). "The blockade of immune checkpoints in cancer immunotherapy". Nature Reviews. Cancer. 12 (4): 252–64. doi:10.1038/nrc3239. PMC 4856023. PMID 22437870. ^ Granier C, De Guillebon E, Blanc C, Roussel H, Badoual C, Colin E, Saldmann A, Gey A, Oudard S, Tartour E (2017). "Mechanisms of action and rationale for the use of checkpoint inhibitors in cancer". ESMO Open. 2 (2): e000213. doi:10.1136/esmoopen-2017-000213. PMC 5518304. PMID 28761757. ^ Cameron F, Whiteside G, Perry C (May 2011). "Ipilimumab: first global approval". Drugs. 71 (8): 1093–104. doi:10.2165/11594010-000000000-00000. PMID 21668044. ^ Lynch TJ, Bondarenko I, Luft A, Serwatowski P, Barlesi F, Chacko R, Sebastian M, Neal J, Lu H, Cuillerot JM, Reck M (June 2012). "Ipilimumab in combination with paclitaxel and carboplatin as first-line treatment in stage IIIB/IV non-small-cell lung cancer: results from a randomized, double-blind, multicenter phase II study". Journal of Clinical Oncology. 30 (17): 2046–54. doi:10.1200/JCO.2011.38.4032. PMID 22547592. ^ Le DT, Lutz E, Uram JN, Sugar EA, Onners B, Solt S, Zheng L, Diaz LA, Donehower RC, Jaffee EM, Laheru DA (September 2013). "Evaluation of ipilimumab in combination with allogeneic pancreatic tumor cells transfected with a GM-CSF gene in previously treated pancreatic cancer". Journal of Immunotherapy. 36 (7): 382–89. doi:10.1097/CJI.0b013e31829fb7a2. PMC 3779664. PMID 23924790. ^ Postow MA, Callahan MK, Wolchok JD (June 2015). "Immune Checkpoint Blockade in Cancer Therapy". Journal of Clinical Oncology. 33 (17): 1974–82. doi:10.1200/JCO.2014.59.4358. PMC 4980573. PMID 25605845. ^ a b van Hooren L, Sandin LC, Moskalev I, Ellmark P, Dimberg A, Black P, Tötterman TH, Mangsbo SM (February 2017). "Local checkpoint inhibition of CTLA-4 as a monotherapy or in combination with anti-PD1 prevents the growth of murine bladder cancer". European Journal of Immunology. 47 (2): 385–93. doi:10.1002/eji.201646583. PMID 27873300. ^ a b Pollack A (18 May 2016). "F.D.A. Approves an Immunotherapy Drug for Bladder Cancer". The New York Times. ISSN 0362-4331. Retrieved 21 May 2016. ^ Steele A (5 August 2016). "Bristol Myers: Opdivo Failed to Meet Endpoint in Key Lung-Cancer Study". The Wall Street Journal. ISSN 0099-9660. Retrieved 5 August 2016. ^ BeiGene, Ltd. "BeiGene Presents Initial Clinical Data on PD-1 Antibody BGB-A317 at the 2016 American Society of Clinical Oncology Annual Meeting". Globe Newswire. ^ Roche. "FDA grants priority review for Roche's cancer immunotherapy atezolizumab in specific type of lung cancer". ^ Merck Group. "Immuno-oncology Avelumab". ^ Cure today. "Durvalumab continues to progress in treatment of advanced bladder cancer". ^ Avacta Life Sciences. "Affimer biotherapeutics target cancer's off-switch with PD-L1 inhibitor". ^ Pfirschke C, Engblom C, Rickelt S, Cortez-Retamozo V, Garris C, Pucci F, et al. (February 2016). "Immunogenic Chemotherapy Sensitizes Tumors to Checkpoint Blockade Therapy". Immunity. 44 (2): 343–54. doi:10.1016/j.immuni.2015.11.024. PMC 4758865. PMID 26872698. ^ Fukuhara H, Ino Y, Todo T (October 2016). "Oncolytic virus therapy: A new era of cancer treatment at dawn". Cancer Science. 107 (10): 1373–79. doi:10.1111/cas.13027. PMC 5084676. PMID 27486853. ^ Haddad D (2017). "Genetically Engineered Vaccinia Viruses As Agents for Cancer Treatment, Imaging, and Transgene Delivery". Frontiers in Oncology. 7: 96. doi:10.3389/fonc.2017.00096. PMC 5440573. PMID 28589082. ^ Marin-Acevedo JA, Soyano AE, Dholaria B, Knutson KL, Lou Y (January 2018). "Cancer immunotherapy beyond immune checkpoint inhibitors". Journal of Hematology & Oncology. 11 (1): 8. doi:10.1186/s13045-017-0552-6. PMC 5767051. PMID 29329556. ^ Aleem E (June 2013). "β-Glucans and their applications in cancer therapy: focus on human studies". Anti-Cancer Agents in Medicinal Chemistry. 13 (5): 709–19. doi:10.2174/1871520611313050007. PMID 23140353. ^ Snyder A, Makarov V, Merghoub T, Yuan J, Zaretsky JM, Desrichard A, Walsh LA, Postow MA, Wong P, Ho TS, Hollmann TJ, Bruggeman C, Kannan K, Li Y, Elipenahli C, Liu C, Harbison CT, Wang L, Ribas A, Wolchok JD, Chan TA (December 2014). "Genetic basis for clinical response to CTLA-4 blockade in melanoma". The New England Journal of Medicine. 371 (23): 2189–99. doi:10.1056/NEJMoa1406498. PMC 4315319. PMID 25409260. ^ Schumacher TN, Schreiber RD (April 2015). "Neoantigens in cancer immunotherapy". Science. 348 (6230): 69–74. Bibcode:2015Sci...348...69S. doi:10.1126/science.aaa4971. PMID 25838375. An easy to understand primer on "Immunotherapy to Treat Cancer"
"And Then There Were Five". Economist. "Discover the Science of Immuno-Oncology". Bristol-Myers Squibb. Retrieved 13 March 2014. Eggermont A, Finn O. "Advances in immuno-oncology". Oxford University Press. Retrieved 13 March 2014. "Immuno-Oncology: Investigating Cancer Therapies Powered by the Immune System". Merck Serono. Retrieved 13 March 2014. Calmeiro J, Carrascal M, Gomes C, Falcão A, Cruz MT, Neves BM. "Highlighting the Role of DC-NK Cell Interplay in Immunobiology and Immunotherapy=November 5, 2018". IntechOpen. This page was last edited on 11 April 2019, at 04:26 (UTC).